I'll be blogging about this tomorrow, but it seems pretty clear that whatever is causing the issue with component store corruption is (a) coming from Microsoft and (b) not currently fixable through ordinary DISM measures. I've now tried both the ESD file from the media I used to upgrade my OS and the WIM file from the MSDN ISO, both with the same failure. I just checked my Windows logs looking for Critical, Error, and Warning items and I have very little (almost no) overlap with what I see showing in your post. 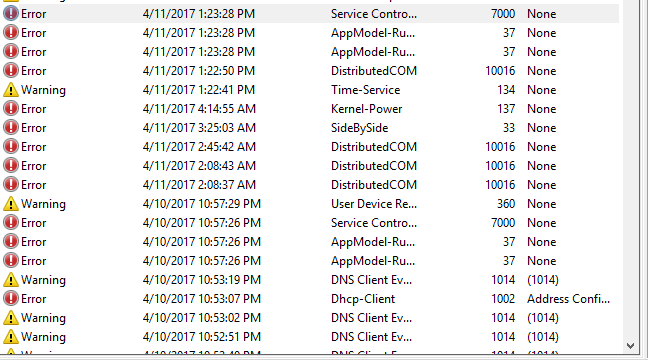 No DCOM items following the upgrade to Creators Update, in fact. Now I don't know what a provider is, but I find it odd that DISM is looking for it in the temporary directory of the current user. I also find it odd how it is unable to recognize C:\windows as a folder. Any thoughts? I blogged about this further this morning (Creators Update Image Integrity Gotcha - Windows Enterprise Desktop). The only machines I have that manifest this problem have Nvidia graphics cards, and the error centers around the inability to find the Nvidia sound driver (NVIDIA High Definition Audio). This is highly reminiscent of last year's troubles with elements of the Nvidia graphics driver environment. Hopefully, MS and Nvidia will be able to synch up for the next cumulative update and get this fixed. PS: I'm not sure this has any bearing on the preceding post. In particular the error message about C:\Windows is entirely different from what I'm seeing, and FWIW, I agree that this oversight or omission is cause for consternation if not concern. It also diagnoses like a Microsoft problem, however, just like the error I ran to ground on my local machines. My Surface Pro 3 is exhibiting this same behavior. Reinstalling Edge through the delete and powershell does not fix the issue. I do not have an NVidia card, just integrated graphics. When I open Edge, it shows a blank white page and force quits eventually (or I kill it in task manager). Tried off the domain, new user, deleting edge folder in safe mode. Nothing seems to work. SFC comes out clean, DISM is exhibiting the same behavior trying to repair from ESD file (ISO and Media Creation Tool USB). All in all, it has been really buggy update for me. Games ignore nvidia color profiles. Also, I have worse performance overall on benchmarks with random microstutters.. Made multiple clean installs. My only guess is that drivers are still not compatible with Creators update. Lots of event viewer errors.